Ahead of Mother's Day weekend, the Texas House’s self-labeled Freedom Caucus killed two bills aimed at helping the state curb its alarming rise in mothers dying less than a year after childbirth, along with more than 100 other measures. Just ahead of Mother’s Day, two bills seeking to curb Texas’ alarming rise in maternal deaths were among more than 100 that met their demise Friday, the result of maneuvering by a group of House Republicans dedicated to disruption in the chamber. In a stunning blow to public health experts and advocates, the 12-member House Freedom Caucus used a parliamentary maneuver to kill a wide slate of bills, including House Bill 1158, which would have connected first-time pregnant women enrolled in Medicaid to services, and House Bill 2403, which would have commissioned a study on how race and socioeconomics affect access and care for pregnant black women. Both bills were aiming to help the state better understand how to better reach expecting mothers. Between 2011 and 2012, 189 Texas mothers died less than a year after their pregnancy ended — mostly from heart disease, drug overdoses and high blood pressure, according to the state’s Task Force on Maternal Mortality and Morbidity. And the state’s maternal mortality rates nearly doubled between 2010 and 2014, the medical journal Obstetrics and Gynecology reported last year. The efforts to address that problem were far from the only ones thwarted as a result of the Freedom Caucus’ maneuvering, which began during an emotional session Thursday, ahead of the House’s deadline to pass legislation originating in that chamber. The other legislation that died included a bill from Rep. Helen Giddings, which would have banned school districts from identifying students without enough money in their school lunch accounts, by allowing families a grace period to resolve an insufficient balance on a meal card. Rep. Tony Dale’s effort to crack down on sexual coercion of young children using the internet was also a casualty. Additionally, a sunset safety net bill died. If a similar measure does not come out of the Senate, it could mean Gov. Greg Abbott will have to reconvene lawmakers for a special session to keep a long list of state agencies from shutting down. All state agencies must undergo periodic "sunset" reviews by the Legislature or be forced to shut down if reforms aren’t passed. The caucus blocked the bills by objecting to their listing on the local and consent calendar, which fast tracks legislation not expected to generate debate. If five or more lawmakers object to a bill on that calendar, it must be considered in the regular legislative process. The caucus members booted the bills from that calendar and slowed down proceedings Thursday night to prevent many other bills from being discussed before the midnight deadline. The caucus members announced Thursday they were punishing House leaders after what they called a session of routine obstruction of key anti-abortion, 2nd Amendment and property rights bills. 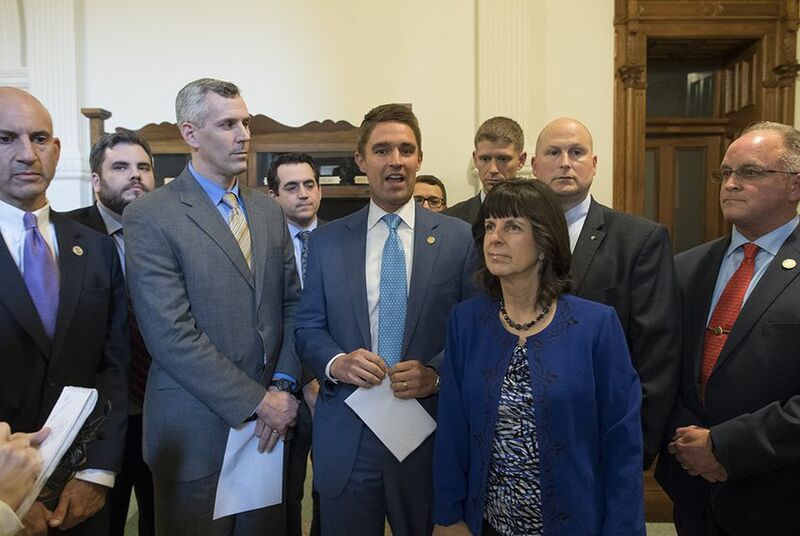 Rep. Shawn Thierry, D-Houston, was in tears Friday morning recounting how she tried to talk to members of the Freedom Caucus, including Tinderholt, Jonathan Stickland and Kyle Biedermann, out of putting HB 2403 on their hit list. She argued to them that it was a "pro-life" bill, because the black mothers who died had carried their babies to term. Caucus members agreed, she said, but declined to change their plans and told Thierry it wasn't personal. "It was like a drive-by shooting," Thierry said. Thierry said she would try to resurrect the bill as an amendment on Brenham state Sen. Lois Kolkhorst's Senate Bill 1929. That bill would include sunsetting the state's Task Force on Maternal Mortality and Maternal Morbidity in 2023. Giddings was among those also hoping to revive bills by attaching them to other measures still moving through the Legislature in its final weeks. The House still has time to pass bills originating in the Senate, which can be amended. "I think what's happened to this bill is unconscionable," Giddings said of House Bill 2159. "We are going to fight till the end." Alana Rocha and Morgan Smith contributed to this report. The deep fractures in the Texas House GOP were on full display Thursday evening as lawmakers faced down a midnight deadline to pass bills out of the chamber. State Rep. Eric Johnson's bill aimed at providing relief for the epicenter of Dallas' affordable housing crisis is among legislation expected to be blocked from a House vote Friday. That would likely kill his bill. With looming deadlines threatening to kill bills aimed at bolstering access to public records, a Texas senator muscled them closer to the governor's desk — all at once. Public health advocates want a state task force focused on Texas' rising maternal mortality rates to study how race, bias, prejudice and socioeconomics affect care for pregnant black women — who are disproportionately affected.